No application is required. We review eligibility for every student each year. 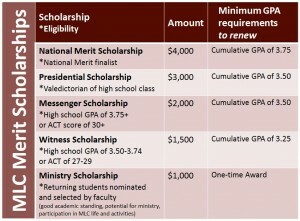 Merit scholarships will be added as part of the financial aid award. Incoming (traditional) first-year students will be considered for merit scholarships based on their cumulative high school GPA or ACT score. 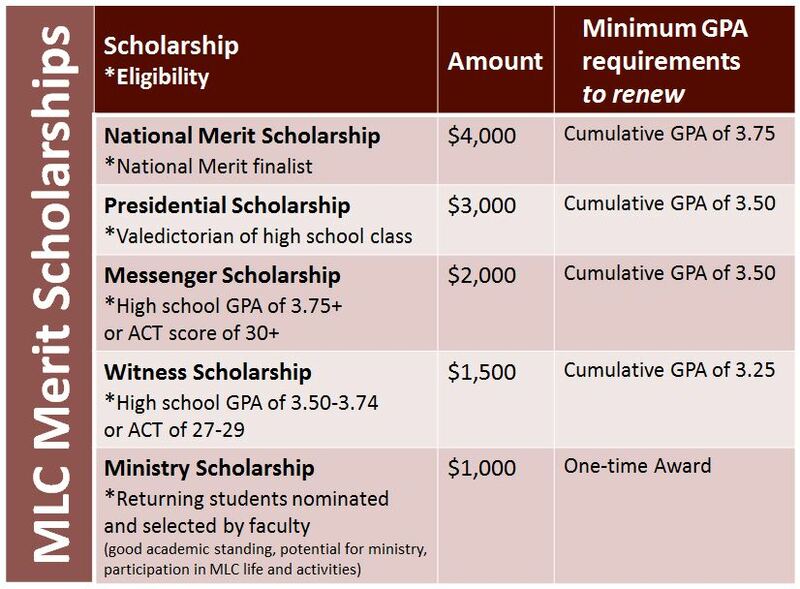 Transfer students and returning MLC students will be considered for merit scholarships based on their cumulative college GPA. Follow our Facebook page for reminders! Please pay close attention to due dates and application requirements. Scholarships are posted for currently enrolled students. Check back on a regular basis for new opportunities. Most scholarship opportunities are from August through March. *Students that receive a designated MLC scholarship will be asked to write a letter of appreciation (thank you letter). Students that do not write this letter of appreciation within the designated time frame will forfeit their eligibility for any future MLC scholarship opportunities (excluding merit scholarships and need-based grants). These scholarships are not associated with Martin Luther College. All questions should be directed to the organization providing the scholarship funding. Guidelines: Pell-eligible students whose parent or guardian died in the line of duty while serving as a public safety officer. Guidelines: Must currently be an enrolled student. Submit an essay between 1000 and 1500 words regarding use of technology and how it has helped your studies. Guidelines: Must currently be an enrolled student. Submit an essay between 1200 and 1500 words regarding the influence of music on your life. Guidelines: Must be an enrolled student (fall 2019), minimum GPA of 3.0, at least part time (6 credits), committed to entering full time ministry in the United States. Guidelines: Must be an enrolled student (fall 2019). Submit a 1,000-word essay regarding connectivity, communication technology, and the types of technology personally used to connect with others. Guidelines: Must be an enrolled student (fall 2019). Submit an 800-1,000 word essay reflecting on your volunteer and fundraising experience. Guidelines: Must be an enrolled student (fall 2020) majoring in a STEM field. Scholarships are available through many different companies and organizations. Spending some time to search for funds and applying to scholarships can be time consuming, but it can also help you get FREE MONEY for your educational costs. Check in your community for available scholarships. Ask your parents if their employer offers scholarships. Use a scholarship search tool online for more opportunities. Searching for scholarships is free. If a website requests money to perform a search, do not use that website.